The tide of World War II started to turn on the 9th of July 1943. That was the day when Allied forces landed in Sicily to start their invasion of Italy. Planned over the previous seven months Operation Husky saw the quick capture of Licata and Syracuse by seven Allied assault divisions, providing a foothold on the Italian peninsula. Having earlier suffered big losses in North Africa this was a hammer blow for the Italian forces. Sensing that the war was lost, within a couple of weeks the Fascist Grand Council had deposed Benito Mussolini and began discussions over Italy’s surrender to the Allied forces. 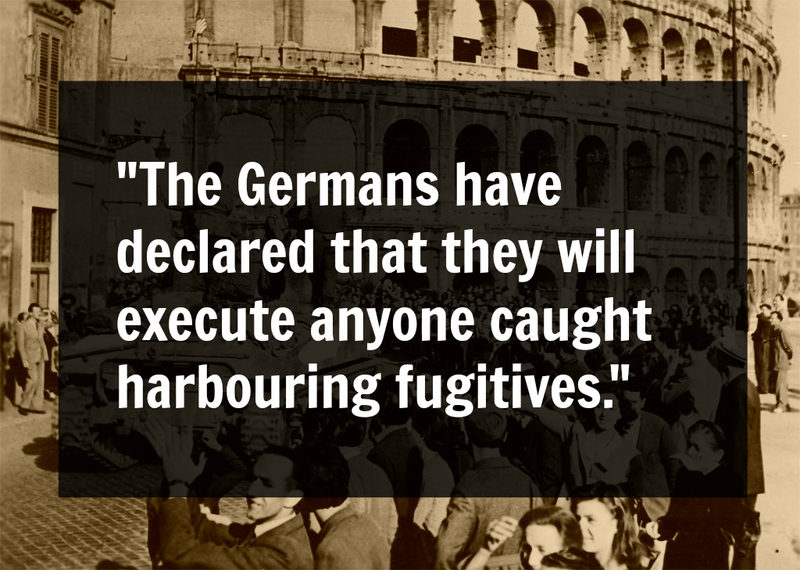 Some Italian soldiers didn’t wait that long, deserting their stations upon hearing of Mussolini’s fate. Italy was in a chaos. The German army stepped in to fill the vacuum. They needed a defensive line as far away from their homeland as possible and this necessitated the occupation of Italy. Yet this was for them a huge disruption. Divisions had to be transferred from other fronts and offensive actions cancelled in order to shore the gap that they could see was forming to the South. This split Italy into two, part occupied by the Allied forces and the rest by the Germans. 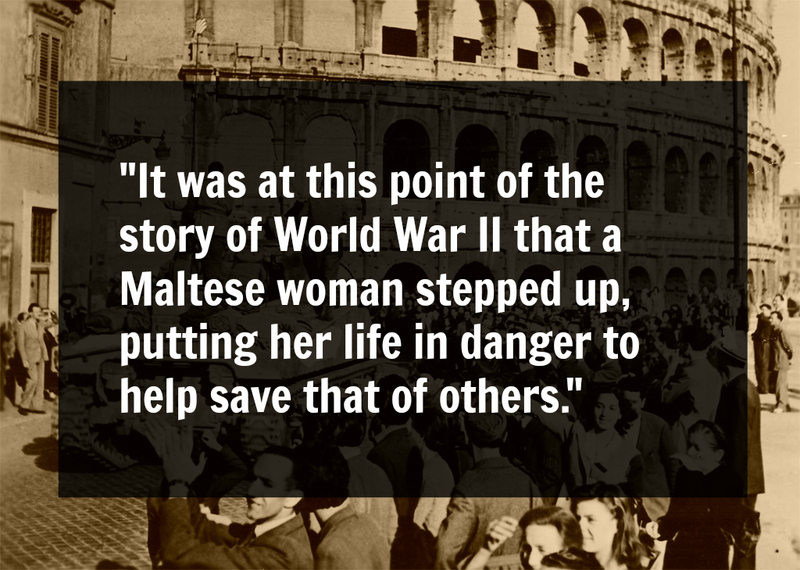 It was at this point of the story of World War II that a Maltese woman stepped up, putting her life in danger to help save that of others. Major Sam Derry had fought in the Battle of Dunkirk before being sent to North Africa. There he was captured twice. On the first occasion he managed to escape, on the second he was transferred to Italy. Life within prison camps was dreary at best where the only thought alleviating the boredom, spartan facilities and lack of food was that of escape. This came to dominate most prisoners’ thoughts to the extent that various plans were customarily being worked on at the same time. The camp in Chieti, where Sam Derry ended up, wasn’t any different and he was soon at the heart of the organising committee. Any plans that they had were however dashed upon the Allied invasion and the subsequent decision to move prisoners of war to Germany. For some the dashing of that hope was too much especially with the knowledge of allied forces close by. The desperation forced some to dispense with the complex plans and simply make a desperate break for it. Some got away; others were not so lucky. Captain Jack Short tried to make his escape during the march to the train that was meant to take them to Germany but was gunned down by the guards a few metres away from where he started his run for freedom. Major Derry was among those who witnessed that desperate attempt. Yet later on that same day, when he managed to loosen some of the train’s floorboards he still opted to jump off. He was among the lucky ones who made it. Indeed he was three times lucky to survive not only the impact of hitting the ground at high velocity and the shots fired by an alert guard but also that the train did not stop to send soldiers to look for him. His good fortune did not stop there. The first people he came across was a family of sympathetic farmers who not only welcomed and fed him but also put him in touch with other escapees in the area. Yet possibly the biggest piece of good fortune came when, having made his way to Rome he was introduced to Monsignor Hugh O’Flaherty. A member of the Roman Curia at the Vatican, the Irish priest had spent a good part of the early days of the war touring POW camps across Italy ostensibly to provide spiritual comfort to the prisoners but also to find out whether any had managed to escape. These names he would note down and then pass on to Radio Vatican to transmit; an indirect yet ingenious way of informing any relatives of the situation. His visits made him a rare friendly face for those prisoners and, once some managed to escape, they thought to seek him out. For most of them his was the only name they knew in the strange and foreign country they found themselves in. The number of these visitors increased drastically upon Germany’s imposed occupation of Italy. Many groups of prisoners suddenly found themselves unguarded when Italian soldiers decided to abandon their posts. 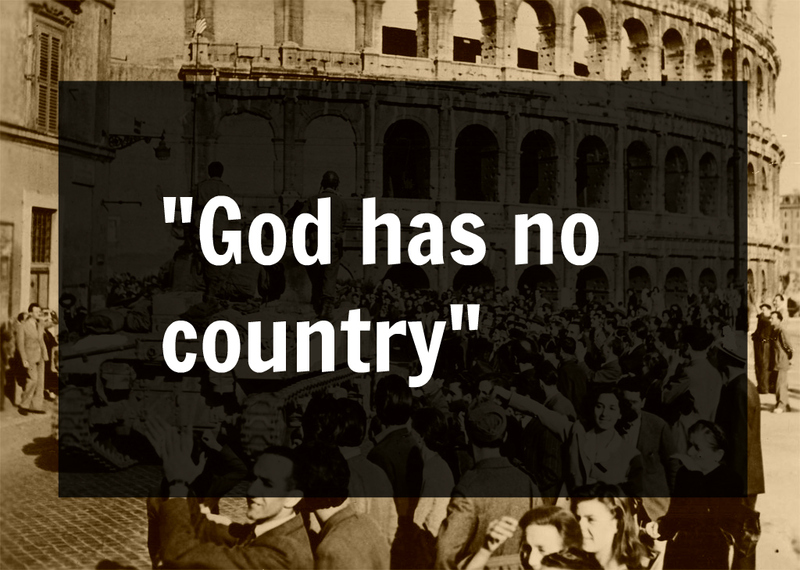 For them all roads did not just lead to Rome, they led to Monsignor O’Flaherty. What they may have not realised was that sympathy for the British did not come naturally to him. Born in the Irish village of Killarney in 1898, as a young man Fr O’Flaherty had lived through the Irish Civil War and witnessed first-hand the atrocities committed – particularly by the English backed Royal Irish Constabulary Special Reserve, more commonly known as the Black and Tans – throughout it. His view of the English was shaped by those incidents and was not a particularly positive one. Before the start of the war he took both sides’ propaganda for what they were, messages aimed at convincing the masses of their righteousness rather than different sides of the truth. For him there wasn’t much of a difference between the two power hungry nations with a taste for empire building. What eventually changed his view was the inhumane treatment to which Jews living in Rome were subjected. He might not have known the horrible fate that awaited them but he had seen what they had gone through in Rome. As he later told Major Derry, he had seen “old men and respectable women” being dragged out of their houses and forced to wash the streets. His view was that any regime which not only allowed such treatment but ideologically supported it had to be evil. It would prove to be a momentous decision. His friendships and resourcefulness, along with ability to convince and motivate people to help, would in time frustrate the German authorities trying to put a stop to his activities. Regardless of how hard they tried – and what methods they adopted – he always found ways to keep on saving people. Such was his ingenuity that he earned the nickname of the Scarlet Pimpernel of Rome as he dextrously set about ensuring that he lived by his guiding principle that “God has no country” and saved as many people as possible. The Vatican, with its diplomatic immunity, provided one outlet for him to do so. It proved to be a safe haven for some but he quickly came to realise that space was limited and so went about finding others within the city willing to host those on the run. 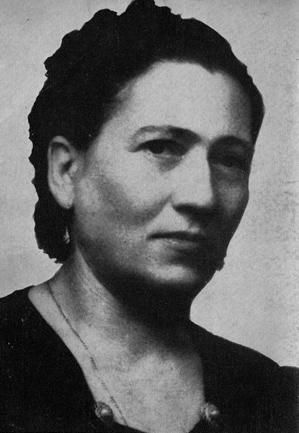 Henrietta Chevalier, a Maltese widow more commonly known as Cetta, had been the first to whom he turned. There does not seem to have been anything connecting Fr O’Flaherty to Mrs Chevalier before the war so it is reasonable to imagine that the initial contact came through a number of Maltese priests who also resided in Vatican and who harboured similar feelings towards helping those in dire need. Among his allies he could count the Maltese Augustinian Egidio Galea, Aurelio Borg and Ugolino Gatt who at various points risked their own life in order to help save that of others. Another Maltese ecclesiastic member played an even more prominent role. Brother Robert Pace was a member of the De La Salle teaching order who was known for his gentle character, his perfect Italian and for the two white ribbons that he always wore off his dog collar. In fact, Brother Pace had been charged by Giovanni Battista Montini – who later became the Pontiff and took the name of later Pope Paul VI – with running a network of safe houses for both escaped allied soldiers and Jews. In all probability he was the one who pinpointed Mrs Chevalier. He was certainly the one who temporarily hid British Major General Michael Denman Gambier-Parry there after his escape from a POW camp late in 1943. Whoever it was that made the connection, they certainly found a welcome home in her flat on the third floor of a five storey building in Via Imperia that quickly became Monsignor O’Flaherty’s first port of call. Henrietta Scerri was born in Sliema on the 2nd of April 1901 to Emmanuel Scerri and Maria Mamo. The family were fairly well off and Cetta, as she was commonly known, lived a life of relative comfort. In 1920, she married Thomas Chevalier and the newlyweds settled in Rome where Thomas worked as the local representative to the British travel agency Thomas Cook. The two had eight children – two boys and six girls - and life was chaotic but happy. Yet tragedy soon struck. Thomas died prematurely in March 1939 and before Henrietta could return to Malta, the Second World War broke out. Many foreign nationals in Italy were interred and this included any Maltese residing in Italy who refused to renounce to their British citizenship to essentially switch sides. Henrietta too refused but she was probably deemed to pose little national risk and was allowed to stay in her flat in Rome. She did, however, have to suffer the heartache of seeing her eldest son Joe interned and he had to spend the war in captivity, first at the notorious Regina Coeli and then at a number of other camps. Coping with such a huge family on her own during such testing times must not have been easy for her. War inevitably causes deprivations and shortages which can be devastating for anyone but particularly tough on a single mother with five young mouths to feed and a small pension to live on. 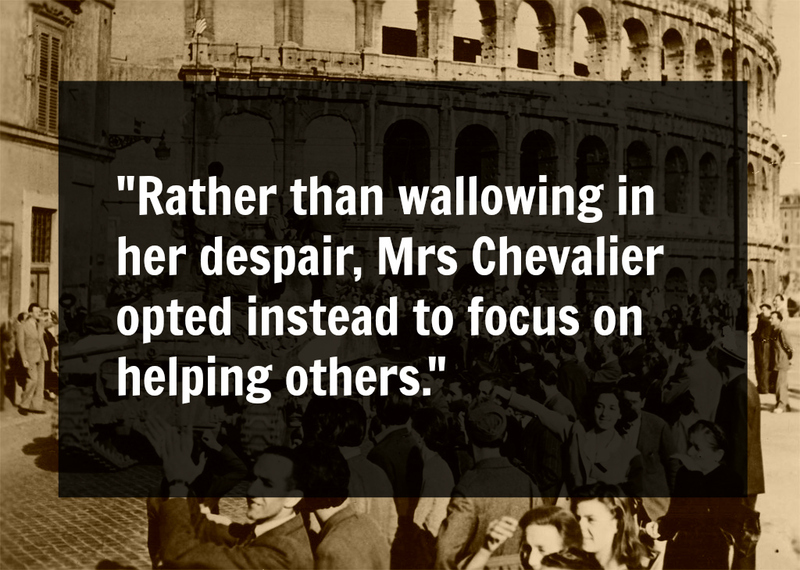 Yet rather than wallowing in her despair, Mrs Chevalier opted instead to focus on helping others. When Major Derry visited Henrietta Chevalier’s flat, he promptly noted how crowded it was. She lived there with five of her daughters. Her youngest daughter had been sent to live with nuns in Rome in order to shelter her as much as possible from the dangers of war. Her other son, on the other hand, worked as a clerical officer with the Swiss Legation at the Vatican where he lived and, as such, had diplomatic papers that secured his safekeeping. Early on in the war, she had provided assistance to a fellow Maltese. Dr Carmelo Cassar had been studying in Rome when the Italy joined the Axis Powers and, having refused to renounce to his British citizenship, he knew that imprisonment awaited him. So rather than return to his University lodgings he sought out refuge elsewhere and found this with Mrs Chevalier. For weeks he managed to evade capture but in time he too ended up at the Regina Coeli prison. So she knew what she was in for when her son brought home two Frenchmen that Monsignor O’Flaherty had sent to stay with her for a couple of days. He wasn’t keen on involving her but it was an emergency and needed somewhere where they could stay until he could make alternative arrangements. She didn’t hesitate. “I know that God will protect us all,” she told Monsignor O’Flaherty. 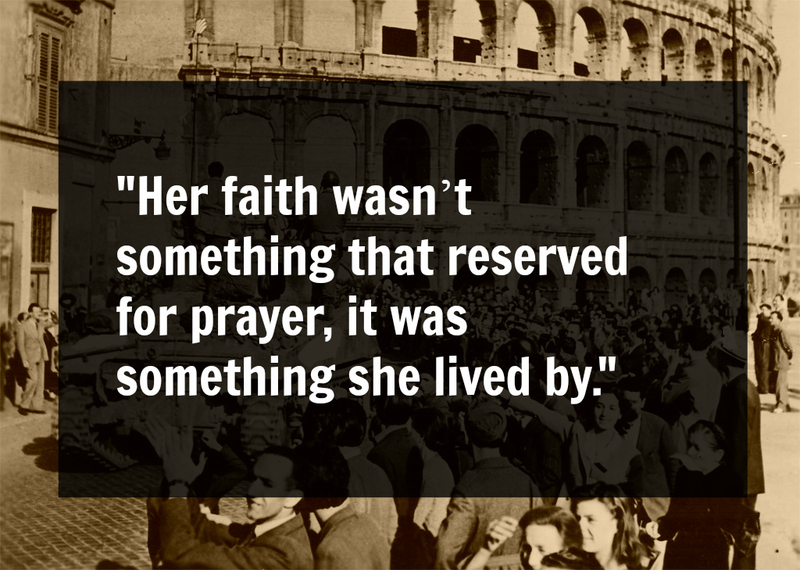 Her faith wasn’t something that reserved for prayer, it was something she lived by. In many ways, Mrs Chevalier was the perfect host. She was bi-lingual, charitable, resourceful and intelligent. Her large family was another asset. That of allowing escapees out whilst accompanied by one of her children was a trick that was frequently used. After all, sharp though the gestapo agents and their informants were, they surely never suspected a father out for a stroll with a young girl to be anything more than a father and daughter. The family was also tactfully used to bring in food from various sources. Getting the food required for an extra three or four people might seem suspicious for flats that should be housing two or three people. But not in Mrs Chevalier’s case, not with the size of her family. She had also raised her children well and they modelled her behaviour on their mother. Gemma, one of her elder daughters, was as sharp as her mother was. She kept track of their spending in a copybook so that they could claim their expenses whilst at the same time never risk over-spending. Of all of the Chevalier children, she was the one who was the most active in the whole operation. Another of her elder daughters, Rosie, typically concerned herself with the house and the cooking. That Mrs Chevalier managed to get enough food to feed everyone in spite of all the shortages brought on by war was more than impressive. She did this thanks to her affability and the friendships that she made with a number of sellers. Typical was the case of Giovanni Ceccarelli, a local butcher who, having been told by Monsignor O’Flaherty of the operation that she was running, actively helped her out with all the meat that she and her guests needed. He also helped source sugar and other items off the black market whilst a baker provided her with all the bread that she required. After Major Derry had joined and brought more organisation to it, one of the more impressive aspects of the Rome escape line was that those within it were given a weekly allowance with which they could buy some extra comforts like cigarettes and extra food. Yet it is telling that when it was decided to increase this allowance, he decided those staying with Mrs Chevalier were exempted so well cared for were they. 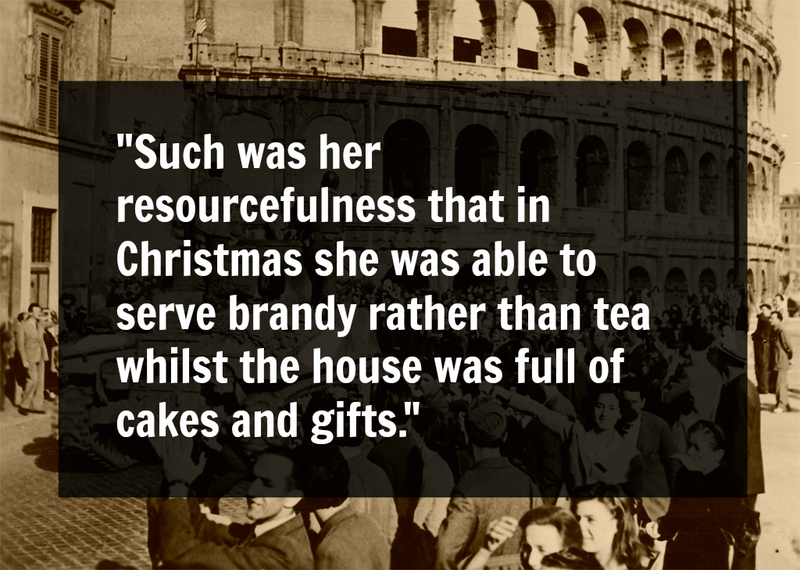 Such was her resourcefulness that in Christmas she was able to serve brandy rather than tea whilst the house was full of cakes and gifts. Even black market operators were in awe of her ability to source all that she needed. But perhaps her biggest strength lied in those who admired her courage and went out of their way to make sure she was safe. On one occasion, having been forewarned by her son Paul of a possible raid, it was the building’s porter Egidio who came to tell her that the Germans would be at her flat within ten minutes. The fugitives who at the time were at her flat had already been sent out with three of her children and the flat put in order. Naturally, the search did not come up with anything – although they got a fright when the commander started picking through her daughters’ vinyl collection that included a number of incriminating British records – and before leaving he simply said “well done.” It was a comment that puzzled Henrietta and it was her daughter Rosie who realised that he was congratulating her for managing to get away with it. By nine, everyone was sat together at the dinner table eating pasta. It was such timely warnings that saved her more than once. On many instances these came from unexpected sources. One evening just before curfew there was a knock at the door and the youth waiting outside, whom the family knew only by sight, warned them that their house was going to be raided on that same evening and offered to take them to his house. This placed her in a difficult position: was she to trust this information and possibly send out her lodgers into a trap or was she to do nothing? Ultimately, that decision was taken by the Englishmen themselves who opted to pick up their belongings and leave rather than put the family at risk. Fortunately for them, there was no trap and group of German soldiers were indeed at the door within minutes. This was one of those situations where the size of Mrs Chevalier’s family came in useful. Faced with so many people in the flat, the German commander mentally wrote it off as a false denunciation especially after Mrs Chevalier replied “there’s barely enough space for us, where would I put them?” when he asked about her harbouring soldiers. His men still went through the flat but the additional mattresses and food supplies failed to raise any undue suspicion as they were written off as necessary for a family that included so many people. Mrs Chevalier’s charm and courtesy also help convince them of the falsity of the report. So much that by the end of the visit the German commander was himself apologising for the intrusion and enquiring whether she had noticed any strange movement of people in the previous days. At this point, another aspect of Henrietta Chevalier’s character came to the fore: her cleverness. She was aware that some families in her block were keen fascists and suspected that it was one of them that had made the report in the first place. The German commander, however, wasn’t aware of all this so when this nice middle-aged woman pointed out a neighbouring flat as the source of her suspicion, he was more than willing to give her heed. Delightfully for Mrs Chevalier, he proceeded to raid this flat and for the next hour or so his men tore it apart looking for any shred of evidence to back up those claims. The subsequent sounds of furniture being manhandled and cries of protests must have been particularly satisfying for the Maltese family who knew that they had not only managed to evade this surprise visit but also gotten some pay-back on those who wanted to see them come to harm. 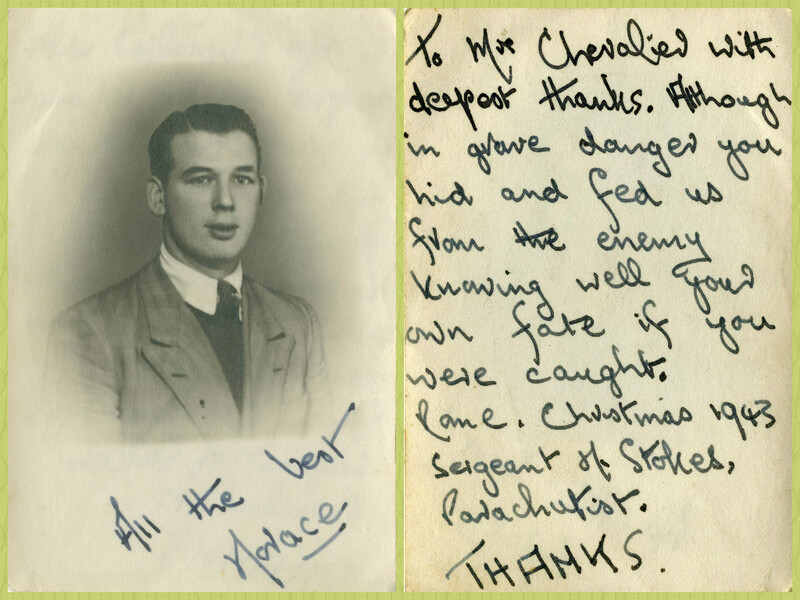 To try and minimise this danger, Major Derry gave code names to the most prominent members of the Rome organisation with Mrs Chevalier being nicknamed Mrs M, a nod to her being Maltese. In spite of all the care and security measures taken, the German authorities had their own means of gaining information and getting to those helping the group as another Maltese, Brother Pace, would find out. Asked to find housing to two escaped Englishmen, he arranged for them to meet two Italians - Andrea Casadi and Vittorio Fantini - who could host them in their flats. Sadly rather than handshakes, the supposed refugees extended pistols to welcome their hosts. All three ended up being marched through the streets of Rome until they got to the Gestapo headquarters on Via Tasso where they were arrested for questioning. Although all the prisons in Rome during the war were brutal, none was as feared as this one such were the torturing techniques to which prisoners were subjected. That is what the three had to suffer for the following days as the Germans tried to extract as much information as possible out of them. Thanks to him sticking to the story - that he had been asked by a local priest to help the two, thus having no knowledge of who was involved - along with the work that he had done previously with wounded German soldiers, Brother Pace managed to get a temporary reprieve at which point he ‘vanished’ inside the Vatican. The two Italians weren’t as lucky. After eight days of questioning they were included in the list of prisoners to be taken to the Ardeatine Caves with their hands tied behind their backs, forced to kneel and then shot in the back of their heads. For all the risks, Mrs Chevalier continued to push hard to help. Even when Major Derry decided that it was too risky for her to keep any more people with her, given how tightly monitored she was, she complained and wanted to be kept informed of the health of “her boys” as she affectionately referred to those who stayed with her. Sometimes it was impossible to avoid using her flat. During the First World War she had served as nurse at a military hospital and this experience came in useful in Rome where she went round various flats to help any escapees who needed medical attention. One particular parachutist who ended up in her home arrived with lice, scabies and a high fever. “In two weeks she had me all fixed up,” he said. So when it came to decide where Private Norman Anderson, an escapee who had just been operated for appendicitis and was in a pretty bad shape, was to stay she was the obvious choice. In her flat he could recover thanks to a combination of her attention and her access to food that could speed up him gaining his full health. With her he would get the motherly love and attention that someone in his condition needed. Unfortunately for him he wouldn’t be able to enjoy this for long. Once again Mrs Chevalier was forewarned of an upcoming raid by a young man who worked in a minor capacity at the German headquarters. He had hear about it and decided to pass on the message despite possibly not being aware whether she had anything to hide. It was a huge stroke of good luck but that did not dampen the drama of the situation. With less than two hours to spare she had to make sure that the six men staying with her could leave without raising any suspicion. The fit escapers left within five minutes of each other. This left the problem of the recuperating Anderson who was still far from strong enough to leave by himself. Some of Mrs Chevalier’s children rushed to Monsignor O’Flaherty to tell him of the situation and, in turn, he quickly roped in the wife of an Irish diplomat who drove to the flat in the company of a Father Buckley. As soon as they arrived, the latter rushed up the steps and helped Anderson get into the car. Even with her own life seriously under risk, her main concern remained the health of the recovering soldier who she was sure would not survive such a brusque and painful journey. Still, the flat had been cleared well in time and when the raid arrived everything looked to be normal. Once again it was the size of the family that helped her avoid close inspection as the police assumed that that with so many people living in the same small flat there was no room left for them to be harbouring anyone and left shortly after. With the immediate danger over, Mrs Chevalier’s focus turned once again to her former charges. Moving them once more wasn’t an option but she made it a point to visit as many of them as possible in their new lodgings. Despite her emotional nature, Mrs Chevalier was far from naïve. Fiercely protective of her family – both her own children and those trusted in her care - she was constantly alert to any sign of possible danger. So when two men and an Italian woman started spending days seated at the window of a café in front of her building block she was quick to realise that her home was under surveillance. After her earlier close escapes, it had been decided that Mrs Chevalier’s flat could no longer be used to host escaped British prisoners of war. Yet she had been such a welcoming host – most of those who stayed with her ended up referring to her as Mother – that those who had been transferred to other residencies were willing to risk capture in order to occasionally visit her. It was one of these casual trips that she was most wary of. A message was sent to those managing the escapee networks who in turn reinforced an earlier order that no one was to leave their current residence, particularly for something as frivolous as a courtesy visit. Yet these were young men who were emboldened by their ability to elude the local authorities and despite the deprivations of war restraining them was not easy especially in a city filled with as many attractions as Rome. For many boredom won out over fear and such orders went ignored. That is what led two particular escapees – a Briton by the name of Martin and an American called Everett – to one day opt to visit Mrs Chevalier. They hadn’t received the second message warning them of the situation and casually made their way to Via Imperia in the belief that the usual warm welcome awaited them. What they found instead was a woman fully aware what this visit meant for her family, the two visitors and herself. “Go! Go! Go!” she urged them having quickly told them of those monitoring the comings and goings of her flat. It was a warning that they heeded, running down the steps as fast as they could. Their actions showed just how much they cared for Mrs Chevalier as their biggest consideration wasn’t that of saving themselves but rather minimising as much as possible the danger that they had put her in. Given the speed of their exit, it was plausible for anyone to argue that they hadn’t made it up five flights and, possibly, help exonerate their hostess. For that plan to work they needed to put on an act. As soon as they got to the main door they slowed their pace to that of an idle walk appearing to all intents and purposes like two men chatting as they went about their daily chores. A gestapo agent got out of the café to stop them but he never got the opportunity as the two soldiers promptly ran away with all their might as soon as they turned the first corner. Whilst all this was going on, Mrs Chevalier was intent on saving her family. One by one she sent out her children with each one being ordered to go in different directions as soon as they got into the street. Again the plan was to try and fool the gestapo agents that this was simply a case of different family members going about their normal, daily chores. She had little hope of saving herself but at least she wanted to ensure that their children got away, aware that their youth might not necessarily be enough to save them if they were caught. Happily, luck once again favoured her and the plan worked. After all the children had gone out, Mrs Chevalier readied herself and went into the street fully expecting to be stopped. Yet nothing happened. For the next few hours she roamed the streets of Rome, taking as haphazard a route as possible so as to ensure that if anyone was tailing her they would either get lost or else disheartened. All the time she was expecting a tap on her back or an order to stop but none came. Eventually she reached that which had been her destination throughout; a friend’s house. There she found the rest of her family who had all done as she herself had, taking a circuitous route before dutifully arriving at the address that they had been given. Elation and prayers of thanks welcomed ever new arrival until every member of the Chevalier family was safe and sound. The following weeks were not easy for the whole family as they suddenly found themselves being the lodgers away as much as possible from danger, living on a farm in the outskirts of the city. Mrs Chevalier’s time harbouring fugitives had come to an end. 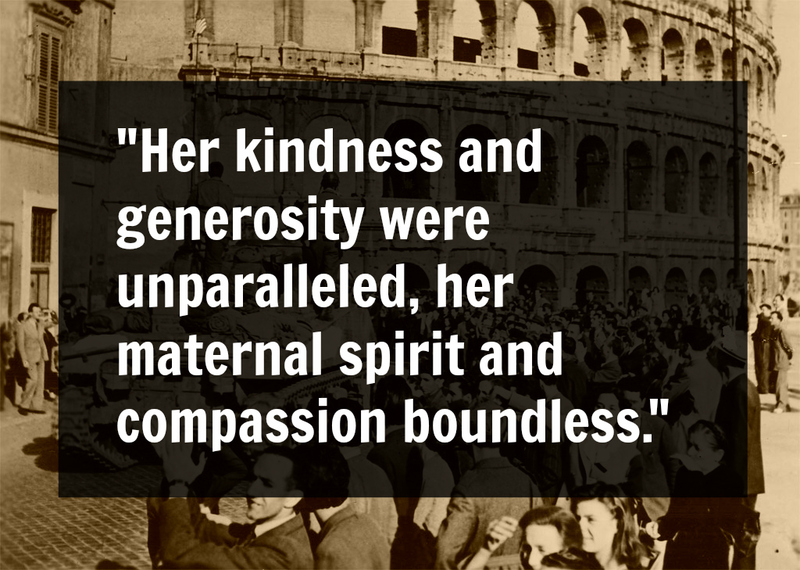 For her and her family there was nothing left to do except hide, pray and hope for the liberation of Rome. Rome was liberated by American and British forces on the 4th of June in 1944. The Germans had declared it an open city so no resistance was encountered and there was no destruction or unnecessary deaths. One of the first tasks that Field Marshal Harold Alexander, commander of the British 15th Army Group, took upon himself upon taking up residence in Rome was that of honouring those who had helped the allies despite the German presence. Those who formed part in what came to be known as the Rome and Vatican escape line were among the most prominent recipients of his gratitude. In total Monsignor O’Flaherty’s and Major Derry’s network had helped save over four thousand people, largely allied soldiers and Jews, from the deprivations of prison camps or worse. 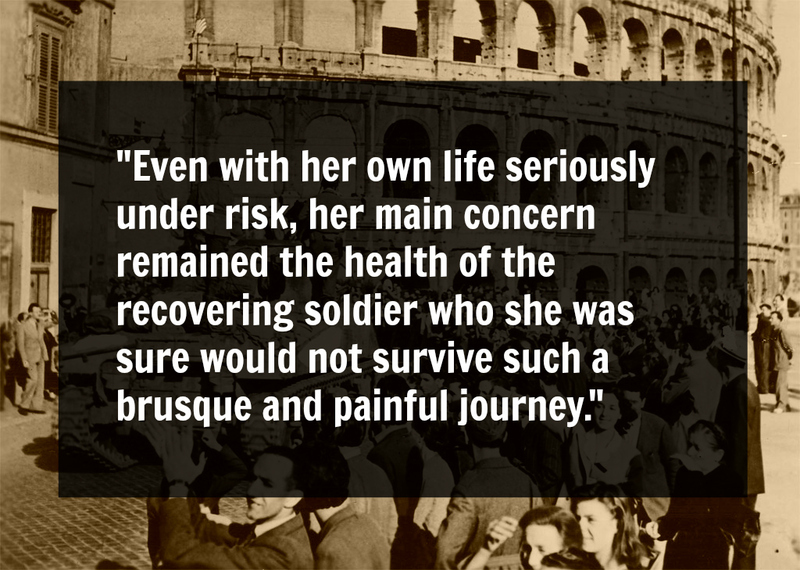 For Mrs Chevalier, the end of the German occupation of Rome meant the return of a certain degree of normality. An element of tranquillity could return to the family home and her children could grow up in relative peace. As with all of those who lived through it, the war left a huge mark on them but some positive did come from it all. One of her children, Gemma, met an English soldier – Kenneth Sands – after the liberation of Rome and the two were married by Monsignor O’Flaherty in a church in Rome. It provided something of a happy ending. In the meantime there had been some official recognition of their help. When the London Gazzette carried the announcement on behalf of the British Governments over the awards that were to be handed out at the end of 1945 Mrs. Chevalier’s name was there, one of the few civilians to be honoured in a list largely dominated by military personnel. She was awarded the British Empire Medal for acts of bravery (BEM) along with Monsignor O’Flaherty (CBE), Fr Aurelio Borg, Fr Egidio Galea and Brother Robert Pace (all OBE). If there were any doubts as to the vitality of her role, this award removed it. Not that she really needed any validation for her heroism. This had come in the recognition of those who stayed with her and of those who ran the Rome escape line. After the war a large number of pictures from escapees that she had housed where found, many of them with grateful messages scribbled on them thanking her for her hospitality and courage. Those who opted to author books to relay their experiences all made sure that they gave Mrs Chevalier, and her family, plenty of recognition. When Lieutenant Walter Simpson, one of the foot soldiers who ensured that escapees were delivered to the various safe homes and made sure that they were supplied with money, spoke of her during the ceremony where she was awarded the British Empire Medal, he said "calm, smiling Mrs Chevalier whose fearless, untiring work as Mrs M" had earned her the medal. Photo and letter of Horace Stokes, one of the escapees who stayed with Mrs Chevalier. Once the war was over, Mrs Chevalier was no longer forced to stay in Italy and returned to Malta. She lived in Sliema for the rest of her life until she passed away on the 7th of July 1973. Her remains lie at the Addolorata Cemetery. There is little to no testimony on what her life was like once the war came to an end and it is hard to surmise how she lived with the memories of those dark days. Such was her attachment to those trusted in her care that a lot of her thoughts must have surely gone on those who didn’t make it through the war or who she couldn’t help. How much she actually did do must have mattered little if faced with such thoughts which must have been devastating especially for a woman as sensitive as all those who came into contact with Mrs Chevalier declared that she was. It is also difficult to tell how she dealt with the relative anonymity of her new life. For all the dangers that being in Rome exposed her to, it was also undeniably exciting and invigorating. It allowed her to be a strong woman who had to take decisions and be a leader, something that wasn’t exactly encouraged in women in Maltese society at the time. How must it have felt to lose that power or at least an element of it? Where the people who saw her on a daily basis in the Maltese streets and shops aware of what she had done? Did she enjoy the tediousness of regular life or did she crave the daily uncertainty of her previous life? Whatever her feelings, she blended into background. She became once again just a mother, a role that she loved and treasured, and a care giver. There seems to have been little of particular remark in her final years. Which perhaps explains what happened afterwards and how her contribution went forgotten and overlooked. In all probability it is how she wanted it; recognition wasn’t what she was after. It is still a shame and, bluntly, a disgrace. The story of a Maltese woman who displayed such courage and strength of character should be told to every child, an example of moral fortitude regardless of all danger that they should aim to follow. The name of Mrs Henrietta Chevalier should be one that every Maltese knows just as much as they know that of foreign kings and conquerors that temporarily made the islands their home. Instead she hasn’t even been afforded the minor tribute of having a street named in her honour. To all intents and purposes, the name of Mrs Henrietta Chevalier was allowed to fade away for years until a small garden at the Malta Aviation Museum in Ta’ Qali was dedicated in her honour. It was a small, albeit heartfelt, gesture for a woman whose actions merit much, much more. In a way this is fitting because nothing man made can match the biggest monument in her name; the living and breathing one that she left behind her. Her memory will live on in those individuals that she helped save, their children and their children’s children. It will live on in whatever they achieve, big or small, none of which would have been possible without her courageous intervention. And her memory will be passed on by those whose lives might be touched by these words on her selfless generosity. May we all be able to measure up to this heroic tower of strength. It is amazing what a casual conversation can lead to. This piece of narrative non-fiction would not have been possible if Charmaine Farrugia hadn't spoken to me about Mrs M and that mention stirred in me the desire to know more about this woman. The grandchildren of Mrs Chevalier are doing their utmost to ensure that her memory lives on and they were of huge help. Thanks, in particular to Mr David Sands and Mrs Mo Burton who were always more than generous with their time and replies. In the writing of this story I read a number of books written by those who had actively contributed to the harbouring of people during World War II. All of these were incredible stories of courage and determination. In no particular order, these books included Sam Derry's The Rome Escape Line, La Primula Rossa del Vaticano by J.P. Gallagher, A Vatican Lifeline by William Simpson and The Vatican Pimpernel by Brian Fleming. I encourage you to read them as well. Thanks, finally, to Chris Grupetta and Kristina Chetcuti who read through the first draft of this story and helped me give it a better structure. This story took a number of months of in-depth research which, whilst often a pleasure, was also quite taxing. There are more stories which I would like to investigate in a similar manner but that will only be possible with your help. Purchase the e-book version of this story, share it with your friends or hit the donate button below. A most interesting read. Well done! I seem to remember reading that on her return to Malta, Cetta Chevalier encountered serious mental health problems and had to be admitted to Mount Carmel Hospital. I believe she actually died there. Can you confirm? Thanks for your kind words. My research focused on her time in Italy so cannot shed light on your query, unfortunately, although I will try to look into it.